GDP Growth Rate QoQ Final and Current Account have been published in Japan and the US will release Fed Bostic Speech. 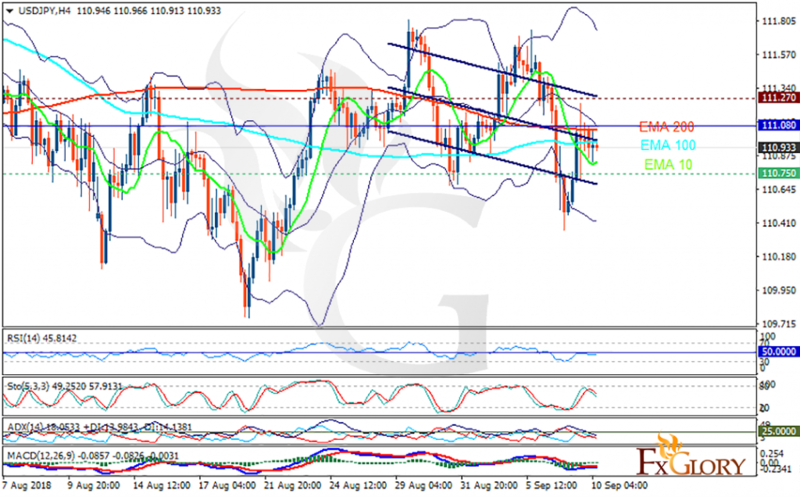 The support rests at 110.750 with resistance at 111.270 which the weekly pivot point at 111.080 is located in between the lines. The EMA of 10 is moving with bearish bias in the descendant channel and it is below the EMA of 100 and the EMA of 200. The RSI is moving below the 50 level, the Stochastic is showing downward momentum and the MACD line is below the signal line in the negative territory. The ADX is not showing any clear signals. USDJPY is creating a zig-zag pattern, creating lower highs and lowers lows. Short positions are recommended towards the lower Bollinger band at 110.4.